I would assume a variety of content is critical to have an awesome blog and increase readership especially when you are starting out. So, obviously, I was planning to post something else this week as I knew I shouldn’t keep cooking chickpeas and fish even though it’s not that far from the reality. But then I went to grocery shopping and found thick, red, perfectly-sized sashimi grade ahi tuna steaks (on sale!) so I had to drop everything and buy them to make this dish because that’s what I do now if I come across a good-looking tuna steak. This is such a recipe. It’s a game changer. It comes from All About Braising, an award winning cookbook by Molly Stevens. I ordered it when I got my first set of Le Creuset simply because I just wanted to make sure I get most out of those heavy pots as they were quite an investment. Soon the book arrived – And it completely floored me with my economically-motivated intentions by opening up a whole new world of cooking possibilities. 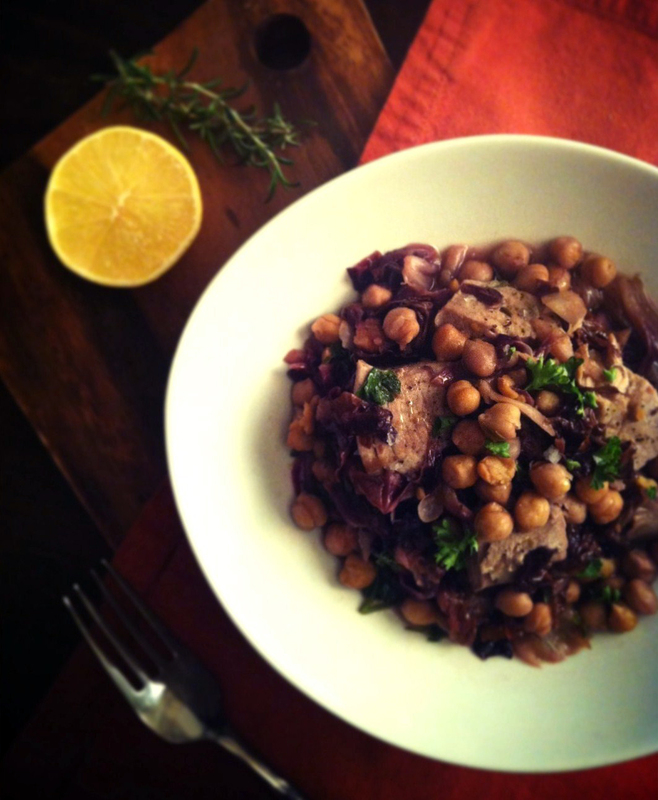 This entry was posted in Appetizer/Snack, Beans and Legumes, Entree, Fish and tagged All About Braising, chickpeas, Molly Stevens, radicchio, rosemary, tuna, tuna steaks on March 17, 2013 by snowcone. Where I grew up, we had a local tofu shop around the corner from my elementary school. Every morning when I walked to the school along with other students, we could see steam coming out of their kitchen window and smell cooked soy beans as they make fresh tofu from scratch. They would close when the daily batch was sold out since that’s all they had, and if you didn’t make it there by 4:30 or 5, you would most likely have to head to a super market to buy packaged stuff – So all the housewives in the area built the stop in their daily routine, including my mother. Their daughter, Fumie, was my sister’s classmate and tofu in my household always had a prefix of “Fumie’s dad’s” whenever it is served, often in miso soup or as is with simple toppings of soy sauce and grated ginger. The shop had been around for a long time in neighborhood, I figured, because Fumie’s dad was my aunt’s classmate, whom everybody in my dad’s siblings lovingly referred to as “the son of the tofu shop”. 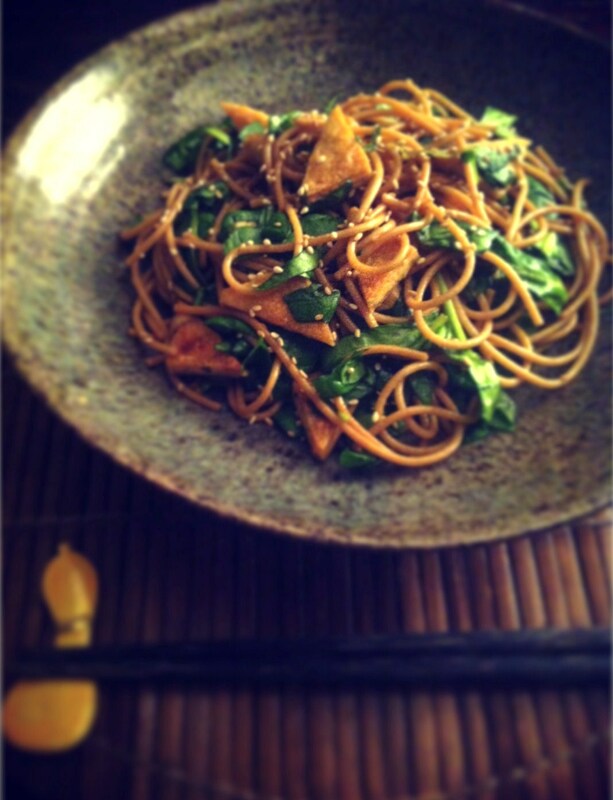 This entry was posted in Entree, Pasta, Tofu/Soy and tagged fried tofu, salad, soy-ginger dressing, spinach, tofu, vegan, vegetarian, whole wheat pasta on March 10, 2013 by snowcone. I will be honest; I am not familiar with Puerto Rican cuisine. Actually, I haven’t even been to a Puerto Rican restaurant. I only decided to try this recipe because it has avocado in it, and I had a big jar of pimento-stuffed olives I bought by mistake that I didn’t know what to do with. I’m aware the statement is wrong in so many ways that it is making my qualifications as somebody who writes a cooking blog even more questionable. But all I have to say is that I’m now finishing the third jar of pimento-stuffed olives, and they are solely used for this dish in my house. Rewound to a few months ago – I really didn’t expect much from this dish. Sure it includes a couple of things I didn’t think about adding to “stew” such as olives and capers. But other ingredients are fairly basic – Garlic, onion, tomato, pepper, and fish. Only spice/herb listed in the recipe are oregano and cilantro, while usual Latin American heavy hitters like cumin, chilli powder, or cayenne didn’t seem to have made the cut. I was skeptical but then thought: How bad could it be? I mean, you can’t possibly go THAT wrong with these. Plus it’s from eatingwell.com, so I get to be skinny at least (Isn’t that how it works?). 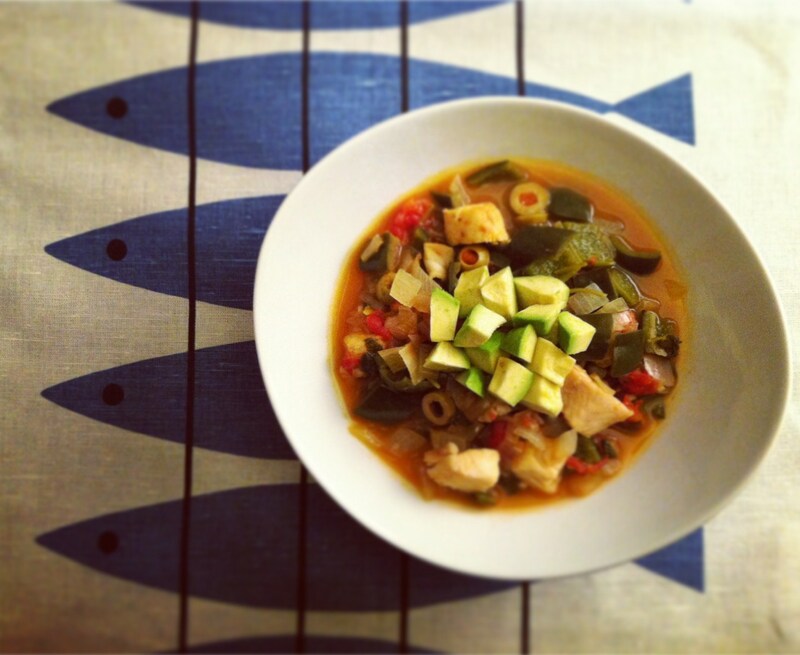 This entry was posted in Entree, Fish and tagged avocado, Bacalao, capers, olives, pimento, poblano, Puerto Rican, stew, tilapia on March 3, 2013 by snowcone.